There's no getting away from it Folks, the days are getting chillier and shorter, and you know what that means? I start thinking about skiing even more !?! This morning I found a new hill to cycle up, a few miles away from home, in order for another phase of physical training before the next ski season. For the first time in months I got cold on the bike, and needed a huge mug of tea and a flapjack when I returned home to help warm up. Anyway I'm waffling, let's talk about skiing. As many of you may know, I like to take the odd photo. So how about starting a new series of blog posts titled 'Why I Love This Photo' where I choose a photograph from last winter, the story behind the image, and why I like it so much. This week shows an image I took of my mate Slippers Jackson helping me dig my car out of snow. We had both been on the mountain all day, skiing in the first of the many big snow storms of last winter. We both just had a brilliant day skiing in the fresh powder. What is often great fun on the mountain, is often a pain in the neck in normal life and practicalities. 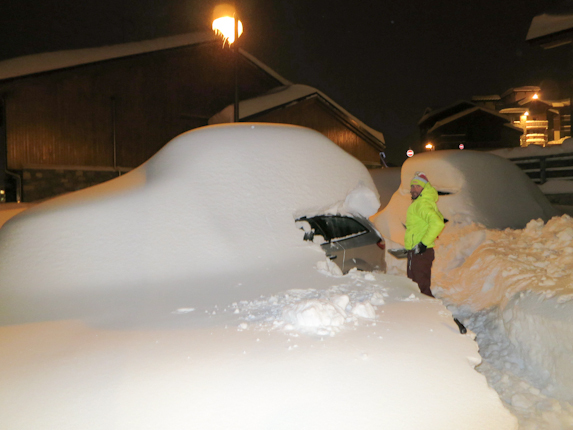 We both knew that if we didn't start digging the snow off our cars, it would start to set into a very heavy mass which makes it even more tiring to clear away. We dug away over a couple of shifts, with the help of others and eventually were able to find an underground car park before the cars got even more buried beyond recognition. Sometimes in the Alps we experience some very big storms that often helps freshen up the mountains. This was different, the photo was taken on December 5th right at the start of the winter. And what a great start to the winter we had. Fingers crossed for something similar this December. In the run up to the beginning of this season, both Michael and I will post more regular articles to help you all get in the mood for the coming ski season, instead of feeling down in the dumps and missing the summer months. If you enjoyed this article, you may be interested in reading a post written by Michael from last winter titled 'Further Thoughts on Practice'. Feel free to share away on Facebook, Twitter and Google+ by clicking on the social media icons. Or even leave a comment below, it's easy to do. Have a great week everyone. Martin.